This free Mortgage Stress Calculator is built to help you find out whether you are experiencing mortgage stress. What is mortgage stress and how is it measured in Australia? Mortgage stress defined as a situation in which homebuyers are paying more than 30 per cent of disposable income on home loan repayments, according to National Centre for Social and Economic Modelling, University of Canberra. Disposable income is defined as total personal income minus personal current taxes. This free Mortgage Stress Calculator calculates your household income tax, disposable income, and mortgage annual repayment. Mortgage Stress Index (the ratio of mortgage annual repayment to household disposable income) is then presented with the ability to do what-if analysis by varying home loan interest rate. 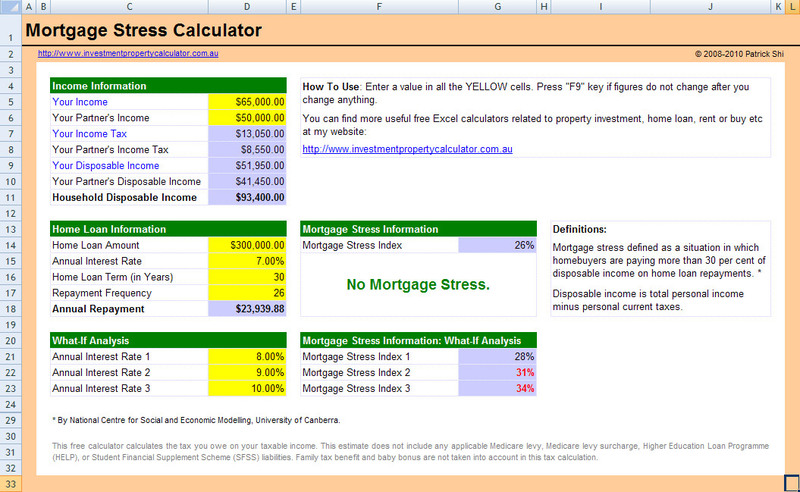 Here is a screen shot that will give you a better idea that what you need to do and what this free Mortgage Stress Calculator can tell you. It also includes an advanced version. 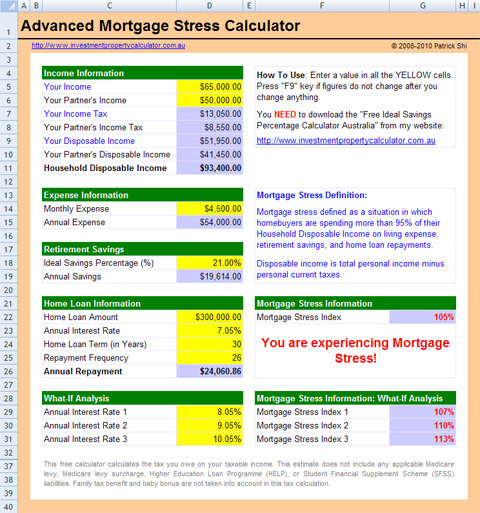 The advanced Mortgage Stress Calculator allows you to include extra information such as expense and retirement savings. The Mortgage stress in the advanced Mortgage Stress Calculator is defined as a situation in which homebuyers are spending more than 95% of their Household Disposable Income on living expense, retirement savings, and home loan repayments. Below is a screen shot of the advanced Mortgage Stress Calculator. 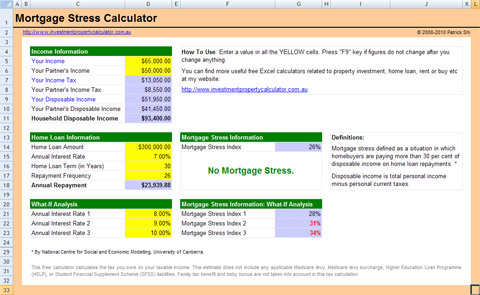 Download FREE Mortgage Stress Calculator Now!